Out of the fifty United States, California is perhaps the most well-known. Whether one loves it, or hates it, chances are no matter where you are in the world; you will meet someone who knows about it. California is not just a name; however, it is an area with amazing natural features, from high mountains, pristine beaches, desolate deserts, and everything else in between. As the third largest state in area, it has innumerable hiking and backpacking trails that crisscross all of these wilderness areas. While some of these trails are household names – such as the John Muir Trail (“JMT”) and the Pacific Crest Trail (“PCT”), others are more obscure. Pack your water bottles, your rain jackets, your merino socks and your hiking towels. From South to North, I’ve compiled a list of California’s ten best trails to day hike. Some of these trails are for hikers of all skill levels and some of these trails are for experienced hikers only; but irrespective of your skill level, all of these top 10 hikes feature amazing scenery and amazing views of the Golden State. Torrey Pines State Reserve is home to the rarest pine tree on the North American continent, the pinus torreyana, which only grows in the park’s confines and on some of the Channel Islands off the coast of California. The park is also home to some of the best Southern California beach views. The best place to see what Southern California used to look like hundreds of years ago is from atop Broken Hill. This two and a half mile loop consists of two trails, the North and South Broken Hill trails. The best part of this hike is the viewpoint at the midpoint of the hike. From this vista, the visitor has a stunning three hundred and sixty degree view of the area. On a clear day, to the East, Mount San Jacinto can be seen; but on any day, the view to the West is spectacular, from the eroded sandstone formations and cliffs; to the iconic Torrey Pines; or to the endless blue of the Pacific Ocean. This is a spot where one can relax for hours and not know that they are in the middle of civilization. The largest freestanding railroad trestle in North America is not in Alaska. It is in a remote corner of Anza Borrego State Park, which covers most of the Anza Borrego desert which stretches from the Mexico-America border North and East. In the summertime, temperatures in the Anza Borrego desert regularly exceed a hundred degrees; and the desert is full of lore regarding strange creatures, strange lights, and other oddities. In the twentieth century, the Goat Canyon Trestle was built to connect San Diego with various rail lines to the east. Today, while the trestle is intact, it is rarely used by current rail lines. The hike to this engineering feat is a challenge in itself, as the “trail” traverses rugged desert terrain. While the roundtrip distance on this hike is only four miles, it is a trip that takes a majority of the day for most people; but the payoff of getting to see a rare piece of railroad history in the remote backcountry of California is decidedly worth it. One of the little known facts about California is that the best beach hike can’t be found on the mainland, but is present in the Channel Islands. The Channel Islands are a group of eight islands that are located off of the coast of California. Five of these eight islands make up Channel Islands National Park; and the best beach hike is located on Santa Barbara Island. In order to hike to Smugglers Cove, visitors will have to catch a boat from either Ventura or Oxnard. From the Scorpion Landing, the trail ascends along a grassy plateau that provides great views of the Pacific Ocean and the other islands, before winding down through a scenic olive grove to a stellar beach that reflects both the blue sky and the water and provides complete solitude. This hike is a moderate eight mile roundtrip hike that is guaranteed to make a person feel like they have traveled abroad, even though they have not left California. Joshua Tree National Park is one of the most well-known rock climbing destinations in California; but is also a location with great hiking. One of the most remote and scenic hikes in the park is the Lost Palms Oasis. This hike offers stunning views; and a variety of terrain for all types of hikers. The hike gradually ascends from the Cottonwood trailhead for one mile before leveling out along a slight plateau. It is worth noting that at that one mile mark, the trail has a junction for Mastodon Peak, which is a small mountain located a half mile to the North. Experienced hikers will want to take this detour either on the way in or way out of their trip to the oasis to have a great view of the surrounding area. From the one mile mark onward, the trail to Lost Palms has a number of features for all levels of hikers, including nearby boulders to explore; and sandy washes and slot canyons to traverse. The payoff of this hike is the Lost Palms Oasis – the only stand of fan palms in the park, as well as stellar views of the desert, including the Salton Sea to the South. This hike is a moderate seven miles roundtrip; although in the summer months, it is a route that should be attempted by experienced hikers only. Sequoia and Kings Canyon National Park is famous for the Giant Sequoias that are present in the park, which are the largest trees that can be found on the planet. While there are many great places to view the trees in the park, one of the best places to hike amongst the trees and see them without the crowds is the Moro Rock Trail. This moderate four mile out –and-back hike departs from near the Giant Forest Museum in the Sequoia portion of the park. Within the first tenth of a mile, visitors will find themselves marveling at the massive size of the Giant Sequoias as they pass underneath them along the trail. This trail winds through a number of meadows and trees, before reaching the midpoint of the hike, Moro Rock. Moro Rock is a 6,275 foot granite dome that protrudes from the valley floor. The ascent along its side is via a hair raising series of steps that were built by the Civilian Conservation Corps in the 1930’s. While the Western view from Moro Rock of the San Joaquin valley can sometimes be obscured, the views of the nearby Sierra Nevada Mountains to the East are never obscured. This is a great hike for all skill levels, and on occasion, is also a great place to view deer and bears. Out of all of the National Parks in California, Death Valley is perhaps the most unknown; mainly because most people assume that it is a barren wasteland. To the contrary, Death Valley has a great deal of unique terrain, ranging from hidden water features, high mountains, craters, sand dunes, and ruins. One of the areas where Death Valley excels in terms of terrain, however, is its canyon hikes. The best canyon hike in the park is Golden Canyon, which is located next to Furnace Creek. The reason Golden Canyon is the best hike in the park is because it allows the visitor to see a number of unique geologic features; and it allows the experienced hiker the opportunity to take a number of side trips, either to the Red Cathedral or Gower Gulch. The hike starts out at the narrow end of Golden Canyon, which rapidly expands to allow the visitor expansive views of its walls before ascending up alongside the massive sandstone monolith of the Manly Beacon. The hike then traverses up and down through some of the canyons, before ascending up to the midpoint of the hike at two and a half miles– the viewpoint at Zabriskie Point. From Zabriskie Point, the hiker can look back and see stunning geologic features such as the Manly Beacon that they passed – and some of the stunning features of the park, from the Badwater Basin to Telescope Peak, the park’s high point. While this is an easy to moderate hike overall, it becomes a challenging hike for experienced hikers in the summer heat of the park. Some of the most stunning mountains in California can be found in the Sierra Nevada Mountain range, which covers a large portion of the state. The tallest mountain in the Sierra Nevada is Mount Whitney, which is also the tallest point in the continental forty-eight states. While Mount Whitney is the tallest point in the state, it is also one of the most popular points in the state. 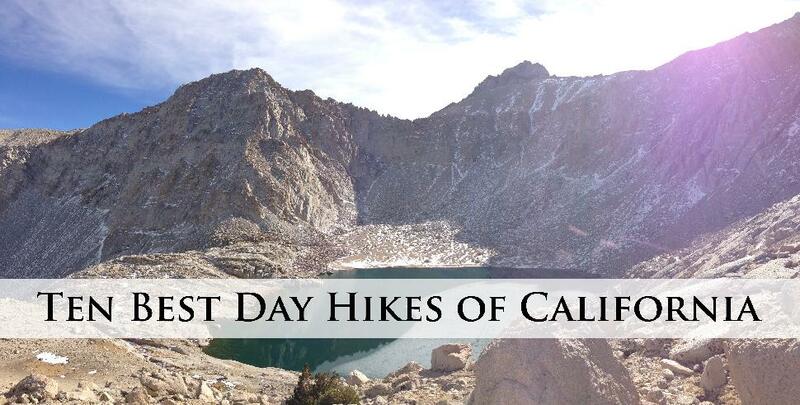 For those people wanting to avoid the crowds of Mount Whitney while having the opportunity to experience the high alpine challenge of the area and the amazing views of the Sierras, the Meysan Lakes are a stunning but challenging hike. The trailhead for the Meysan Lakes can be found just shy of the Mount Whitney Portal; and this difficult hike begins at an elevation of just over 8,000 feet. The trail also ascends over three thousand feet to the final lake, Meysan Lake. This hike offers something for each skill level of hiker, as there are three lakes that can be viewed at different mileages along the trail – Grass, Camp, and Meysan. All of these alpine lakes provide excellent views; but for those hikers who want to see all three lakes, this is a strenuous eleven mile roundtrip hike with alpine views; and few crowds. While there are many great locations in California, Yosemite National Park is popularly known as its unofficial crown jewel. While Yosemite is always in danger of being loved to death during the summer months; its reputation is well deserved year round. Like Yosemite, the Mist Trail has a reputation that is well deserved. Unlike most of the hikes on this list, the Mist Trail is a popular trail year round; and one where solitude is hard to find. But, having said that, the Mist Trail is an iconic hike in Yosemite; and despite the crowds, offers a once in a lifetime experience to walk alongside - and partially underneath a waterfall. This trail departs from the Happy Isles trailhead in Yosemite Valley; and while its three mile roundtrip distance may not sound daunting, this trail is all uphill, as it departs from the Yosemite Valley floor. The trail winds up a series of switchbacks, before crossing a bridge over the Merced River. At this point, hikers will get their first real view of Vernal Falls – the waterfall that provides the “mist” on the trail. From the bridge, the actual Mist Trail begins, heading up alongside the Merced River, before ascending a series of steep (and wet) steps next to Vernal Fall. Hikers should be aware that they will likely get wet during this portion of the hike. The payoff is a great view from the top of Vernal Fall, and as I noted above, the once in a lifetime experience of walking next to/under a waterfall. For those experienced hikers, the trail from the top of Vernal Fall to Nevada Fall is a great addition to the standard Mist Trail excursion. California is also a state with an active geologic history. This means that if you visit California, you may experience an earthquake. It also means that in certain places of the state, you can also experience active volcanism. The best place to do this safely (and without a great deal of strenuous activity) is the Bumpass Hell Trail located in Lassen National Park. This moderate hike departs from an elevation of eight thousand feet in the Cascade Range, and winds up and over a series of switchbacks before descending into the Bumpass Hell region of the park. Here, visitors will find active hydrothermal pools, and an environment that appears better suited for another planet. The Bumpass Hell region features bubbling mud pots; and the Big Boiler – all of which can be safely viewed from the boardwalk that the National Park Service has installed in the region. This out and back trail is a mere three miles; and contains great views of the volcanic nature of the region in addition to the fantastic geothermal features present in the Bumpass Hell. While Southern California has sweeping sandy beaches; Northern California has massive old growth coastal redwood forests, which are the result of a great deal of rain and a much cooler climate. The best place to experience the lush green growth and terrain of the Northern California coast is Fern Canyon, which is located in Prairie Creek Redwoods State Park. Fern Canyon is accessible by foot Prairie Creek Redwoods State Park visitor center; or by Davison Road, which is a nine mile unpaved road that winds through the state park. From the parking area the trailhead is readily apparent, and after a short walk, visitors will find themselves at the entrance of Fern Canyon. Fern Canyon is a visual spectacle, with lush primeval growth covering the canyon walls, bordered only by the tall coastal redwoods above the canyon. The trail winds up and over Home Creek over the course of a mile through the canyon. This distance may seem short – but with the frequent creek crossings, and the visual spectacle that is the canyon, this easy hike can take all day, as it is a one of a kind unique environment.